BEIRUT — Residents of the Syrian town devastated by a chemical weapons attack earlier this week said warplanes had returned to bomb them Saturday, despite a U.S. missile barrage and warnings of possible further response. At least 86 people in the northwestern town of Khan Sheikhoun were killed Tuesday in a chemical attack that left hundreds choking, fitting or foaming at the mouth. Eyewitnesses and a monitoring group, the Syrian Observatory for Human Rights, said Saturday that fresh attacks on the area — now a virtual ghost town — had killed one woman and wounded several others. Photographs from the site showed a pair of green slippers, abandoned by a blood-spattered doorway. 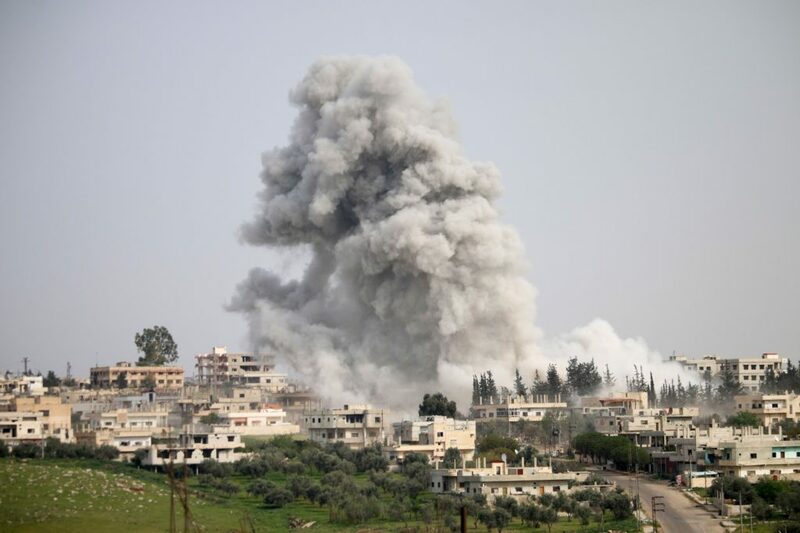 Residents cowered in bedrooms and basements throughout Saturday, underscoring the apparently unchanged threat they faced from the Syrian government’s arsenal of rockets, barrel bombs and other weapons that have resulted in a majority of the conflict’s half-million dead. In retaliation for Tuesday’s chemical assault, President Trump ordered missile strikes on a Syrian airfield housing a jet fleet responsible for extensive bombing across northern Syria. The missile barrage is the first direct military action the United States has taken against Syrian President Bashar al-Assad’s government in the six-year-long conflict. Although Trump warned of possible further intervention, the Pentagon has said no other strikes against government targets are in current plans. Although American officials predicted that the strikes would result in a major shift of Assad’s calculus, they appeared to be symbolic in practice. Within 24 hours of the attack, monitoring groups reported that jets were taking off from the bombed Shayrat air base once again, this time to bomb Islamic State positions. Turkish Foreign Minister Mevlut Cavusoglu described Trump’s decision to retaliate as welcome, but not enough. A longtime backer of Syria’s armed opposition, Turkey is now overseeing a stuttering peace process in the Kazakh capital, Astana, that it hopes will hasten an end to the war. “President Bashar al-Assad should resign and leave power for the love of Syria, allowing the dear people of Syria to avoid war and the scourge of terrorism,” he said. Although some of Iraq’s Shiite militias that are more directly linked to Iran have fought in support of Assad in Syria, Sadr’s Peace Brigades have not, and the cleric promotes himself as a nationalist. In a sign of the continuing diplomatic fallout from the chemical attack and the U.S. response, British Foreign Secretary Boris Johnson announced Saturday that he had canceled a planned visit to Moscow. “We deplore Russia’s continued defense of the Assad regime even after the chemical weapons attack on innocent civilians,” Johnson said. Britain has been supportive of this week’s U.S. airstrikes against a Syrian air base but has said it has no plans to join the United States in any future attacks on Syrian government targets. Meanwhile, Russia and Iran, Assad’s most influential supporters, have rallied around him this week. Russia condemned the U.S. missile strike and suspended an agreement that would minimize the risk of in-flight incidents between Russian and U.S. military aircraft over Syria. The Organization for the Prohibition of Chemical Weapons, a global watchdog, said Thursday that it had initiated contact with the Syrian government, and that it was investigating the attack on Khan Sheikhoun.